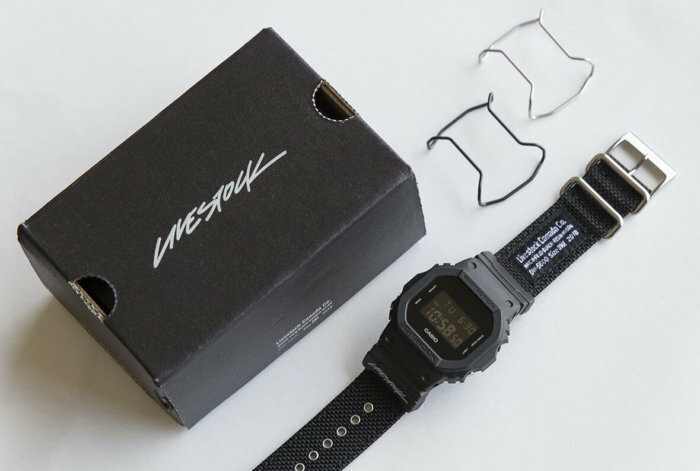 The watch is based on the basic black DW-5600BB-1 and has the usual resin band swapped out in favor of a tactical-style nylon band with a custom MIL-SPEC-inspired label on it. The Livestock logo appears on the lower band adapter and black and silver “bullbar” wire face protectors are included along with a custom Livestock box. The G-Shock by Livestock 5600 watch is available at deadstock.ca for $195.00 CAD. International shipping is available. The watch is also available at Livestock stores throughout Canada with in-store status and locations available through that link.